What makes a successful CEO? Most people call to mind a familiar definition: a seasoned manager with deep industry expertise.” Others might point to the qualities of today’s so-called celebrity CEOscharisma, virtuoso communication skills, and a confident management style. But what really matters when you run an organization? What is the hallmark of exceptional CEO performance? Quite simply, it is the returns for the shareholders of that company over the long term. In this refreshing, counterintuitive book, author Will Thorndike brings to bear the analytical wisdom of a successful career in investing, closely evaluating the performance of companies and their leaders. You will meet eight individualistic CEOs whose firms’ average returns outperformed the S&P 500 by a factor of twentyin other words, an investment of $10,000 with each of these CEOs, on average, would have been worth over $1.5 million twenty-five years later. You may not know all their names, but you will recognize their companies: General Cinema, Ralston Purina, The Washington Post Company, Berkshire Hathaway, General Dynamics, Capital Cities Broadcasting, TCI, and Teledyne. In The Outsiders, you’ll learn the traits and methodsstriking for their consistency and relentless rationalitythat helped these unique leaders achieve such exceptional performance. Humble, unassuming, and often frugal, these outsiders” shunned Wall Street and the press, and shied away from the hottest new management trends. Instead, they shared specific traits that put them and the companies they led on winning trajectories: a laser-sharp focus on per share value as opposed to earnings or sales growth; an exceptional talent for allocating capital and human resources; and the belief that cash flow, not reported earnings, determines a company’s long-term value. 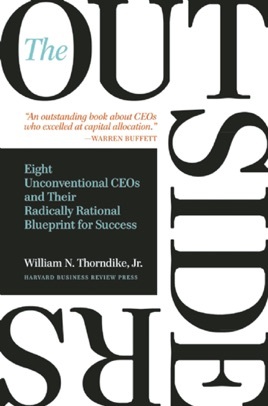 Drawing on years of research and experience, Thorndike tells eye-opening stories, extracting lessons and revealing a compelling alternative model for anyone interested in leading a company or investing in oneand reaping extraordinary returns. I bought the book on Buffet’s and Munger recommendation, …outsiders is misnomer, several of the eight have strong ties to each other Buffett and Graham are two. The dta is interesting, but the writing especially the too often used phrase “not surprisinly” was surprisingly weak. Singletonville is concept borrowed ? from phrase “Graham-and-Doddsville” also from Buffett. Strong start … faded too fast. TCI is company no longer alive. Teledyne died after Singleton… Thorndike does not mention that, Chapter on these just ends. If this were a dish, it would be “clumpy” and uneven. "Beyond Berkshire” by Cunningham is far better focussed and better written. This book is a fantastic read for someone who is about to start a business or is in a managerial position. It shows you successful CEOs thought process and what kind of fundamentals they focused on before taking on a project. Excellent read!